Ready to find the best mid-range drone on the market? The truth is that even when spending $500 dollars on a drone, you could still with a dud, especially if you buy one from one of the fly-by-night low quality importers. Good news for you is that we spent 2 days testing various drones, reading user reviews and coming up with a comprehensive list that will ensure you find a gem in the rough! Let's dive right into our list of top performing mid-range drones, that won't break the bank. 2. DJI Mavic Air – For those with a few extra bucks! Full 4K Camera with Stabalizing Gimbal, Superior Range and Foldable design, we feel dirty including this in the review since its going for over $700. For those with a few extra bucks to spend this drone is in a different class. "Best if you want to invest $200 extra"
Before you purchase a drone, you need to know what you want from it. In this video, we look at exactly that. In order to get the best bang for your buck, it’s important to be aware of the average specifications and features of the products under such price and category. That’s why we have written a brief summary of what you should expect from a drone in this price range. Batteries and drone’s firmware have become much more efficient in the last couple years. Therefore, you should expect an average flight time of 15 to 20 minutes. Some brands prioritize flight time while others focus on other specs. However, keep in mind that increased payload results in decreased flight time. It is one of the most commonly highly prioritized specifications by drone enthusiasts. Of course one wants to have a long range when investing this amount of money in a drone. Fortunately, the control distance is increasing. Nowadays, an average control range for a product within this budget is around 500 to 1000 meters. However, some brands focus on long range and manufacture products that can go as far as 2000 meters. Of course, you must expect (and demand) perfect performance from any drone on this list. Accurate controls, great capability in flying in windy days and steady hover even without any pilot’s input. We have only picked the quads that have top of the line performance when compared to other same price products. As the technology advances, more features are added to drones as companies compete with each other for sales. Therefore, most under $500 products already come with a wide variety of features. Expect a decent amount of drones to feature autonomous flight and functions that enhance camera usage such as Follow Me, Orbit, Point of Interest, GPS assisted flight, optical flow sensors, etc. Most of these drones come with HD and even 4K cameras. They are able to produce amazing quality footage, even to semi-professional standards. They can also carry GoPro cameras and other types of action camera. Although the included cameras are not good enough for, let’s say, recording commercials or transmitting Live Video coverage of sport events. They are definitely able to record amazing footage for semi-professional projects, film school projects, YouTube vlogs, etc. "Ideal For: Beginners, Intermediate and Experts"
I’m sure you have already heard, seen or even flown a DJI Spark drone. It is one of the most recent products by the famous brand DJI. The Spark is one of the most sought drones currently in the market. And not only is it under $500, its often sells for under $400! Extremely easy to carry around in a backpack, it’s one of the best for holidays, filming outdoor events, vlogging, or pretty much anything. Note: For price consideration, the bundle we are referring to doesn’t include the remote controller. Otherwise, it wouldn’t cost less than $400, therefore you have to purchase a remote controller separately if you don’t already own one. Very compact and lightweight, not only it can be carried anywhere, it’s also the most accurate and stable drone under $500 you can possibly get on the market in 2018. It’s equipped with all the latest DJI technology. It has GPS Assisted Hover, Obstacle Detection, etc. Everything you need to truly experience an out of this world performance. From beginners to experts, Spark is a wonder in any hands. Even a baby can fly this thing. On top of all this, DJI Spark also presents some amazing specs, such as the 2km (1.2 miles) max control range. Flight time is also quite impressive if we take into consideration how small the drone is. Per battery, Spark has a max flight time of 16 minutes. The Spark allows you to record beautiful aerial footage that will amaze everyone. The built-in camera has 12MP and records 1080p video at 30 frames per second. It also makes use of a 2-axis stabilized gimbal that eliminates vibration and ensures a steady high-quality image. The drone of course, can also transmit Live Video in high-quality, real-time with 0 latency. The best FPV experience you can get from a drone within this budget. The DJI Spark presents a wide range of groundbreaking features that truly take the whole experience to the next level. I’m talking about Gesture and TapFly Control (tap the screen and the drone will fly on that direction autonomously), FlightAutonomy with Obstacle Detection (don’t worry about hitting objects during flight), GPS Tracking, Vision Position-Based Navigation, 31mp/h top speed in Sport Mode, Auto-Return, among many other incredible features! Editors Award -This drone clinches the award as our best drone under in this price-range. At under $400 when on sale, its reputation precedes itself, and most drone pilots worth his or her salt agrees...if you looking for value for money, just get the Spark, you won't be sorry. Ok, we are cheating a bit, this is not quite under $ 500, but the Mavic Air is just too good not to include in this review. It is a significant upgrade to its predecessors, the Phantom 3 and Mavic Pro, which have both now been discontinued. The Mavic Air features a slightly better camera and sensors, and has extra 20% control range. When it comes to performance, Mavic Air behaves the same as its older brother, the Mavic Pro. Both have astonishing performance, being able to steadily hover in place without any pilot’s input on the remote controller. This drone is a very forgiving flyer, ideal for beginners. Feel free to fly it even windy days, with caution of course. The Air can reach a max speed of 88.4 km/h, which makes it a great beginner Drone Racer. Since we are talking about a more expensive drone, you would expect the Mavic Air to outclass every drone in this review specification wise. This being said, Air has a flight time of 21 minutes and a maximum control range of 4km. One of the main selling points of Mavic Air is without a doubt its camera. The camera can shoot 4K video at 30fps, 2.7K at 60fps and Full HD video at 120fps. If you love aerial photography and videography you will want to take this baby everywhere. The Air comes with a 1/2.3” CMOS image sensor able to capture 12MP still photos with HDR and create 32MP spherical panorama shots. And of course it transmits Live Video too. As you can see most of the features are focused on enhancing the photography and videography experience. Holy Stone has been one of the most interesting companies in 2018. Some of their products have started to really stand out from the rest, as the company proves itself and to its customers, to deserve a share of the drone market. One of their most amazing products is the recently released Holy Stone HS700. I must admit I was very surprised at HS700’s performance, it really feels as I’m controlling a high-end drone. Very responsive, very maneuverable, it’s even capable of flying in windy conditions. I must say, if you are a fan of aerial photography and videography, but do not have a high budget, HS700 is one of the most viable alternatives. At well under 350 dollars, it won’t disappoint you. Holy Stone HS700 has specifications that rival even DJI Phantom 3. First of all, the drone is capable of flying as far as 1km. If like me, you are a fan of long-distance drones, you will love HS700, as it will fly way past your eyesight, and still safely return thanks to auto-return feature. Regarding flight time, each battery allows up to 20 minutes of flight time. Something I was very excited about. ​Holy Stone tried to do what Syma and DJI did. The brand manufactured its own action camera instead of requiring its customers to buy a SJCam or GoPro, or other. However, the camera quality doesn’t quite match expectations. Don’t get me wrong, it’s a good quality camera with 12MP, capable of shooting 1080p video and transmitting live video. But if we consider the price of the overall package, it would be expected a camera with better video performance. It takes good photos, but it lacks video performance quality. Although, I must say, the main problem lays in the lens and the lack of a good stabilized gimbal. Ensuring you get a clear picture, good enough to post on Youtube and social media and show off to your friends. The drone also transmits Live Video via Wifi directly to a smartphone device through a free to download app (Android and iOS). The camera can be placed on a phone holder attached to the 5G remote controller. HS700 packs great features, as expected of a drone within its price range. The highlight surely is the GPS system with Follow Me Mode and Custom Flight Path. Simply draw a route on the App screen and the HS700 will move in that direction or in a circle and send back real time landscape to you. On top of this, it also features auto-return and 5GHz Live Video transmission. It lacks some basic features such as automatic takeoff and landing. But considering it packs a good GPS and waypoints path system, we can’t say it lacks a good set of features. One of the oldest drones on our list, 3DR Solo remains to this day one of the best drones under 500 in the market, despite not being a newly released. Perfect for using together with a GoPro, widely used for semi-professional aerial video and photos among GoPro fans. One of the reasons why 3DR Solo remains to this day one of the most recommend drones for GoPro usage is due to its accurate performance. Equipped with an On-board 1 GHZ computer with Pixhawk flight controller, Solo is very responsive and stable. Definitely the type of drone you want to buy for your GoPro camera. Solo can reach an amazing top speed of 88km/h (55mp/h); not recommend to beginners. 3DR Solo specifications still remain impressive to this day. Base max control distance is around 2km although with a range extension kit it can fly longer than 4km! The flight time, when carrying a camera, is 20 minutes, and without is 25 minutes. For the sake of price we are referring to the package that doesn’t include a camera. Otherwise it would be too expensive to fit this under $500 list. As we have already stated it’s a great purchase to anyone who already owns or is considering buying an action camera such as the GoPro. The 3DR Solo obviously doesn’t come with the most recent technology and features, however it does feature autonomous flight modes, such as Selfie, Cable Cam, Orbit, and Follow. These functions are extremely useful for filming as you will surely find out. The drone’s software can also be upgraded, although 3D Robotics hasn’t released new updates in a while. UPair is actually on of our top drones for less than 300 dollars, so why is it here also? 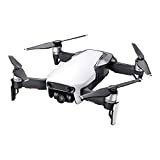 Well, this UPair package features a 4K camera, thus providing it with a top quality camera but also considerably increasing the drone’s price tag. A complete FPV package with all you need to start flying FPV right out of the box (FPV screen included). UPair One is one of the best, if not the best, alternative to a Phantom quadcopter. It’s very easy to control, even if you are a beginner and this is your first time flying a drone. Hovers steadily without pilot’s controller input, so you haven’t trouble to maneuver it. It will avoid many beginner crashes. The GPS assists the flight, enhancing the whole experience. It feels like you are flying a high-end drone like the Phantom 3 (we wouldn’t compare it with Phantom 4 however). UPair One has a great flight time of 15 to 19 minutes, powered by a 11.1V 10C 5400mAh battery, Drone’s maximum control range is 1km, while the Live Video image transmission only goes as far as 600 meters. Capture outstanding aerial video and take beautiful photos with the 4K Camera. The 4K camera is placed on a brushless gimbal that can be adjusted for different angles of view. It transmits Live Video to the 7” monitor screen placed on the remote controller. Real-time video is great quality and has no latency! Love videography and photography but don’t have a lot of money to invest in a GoPro + drone? UPair One is your unexpansive solution for aerial photography and videography. UPair One comes with all the fun and useful features you will need to get the most out of your quad. First of all, it has full GPS lock (able to search and lock on 8 satellites), Position Hold, MicroSD card support (up to 32GB) and Automatic Return. Not the best set of features, but definitely has all you need. Most likely you already know this drone. It’s the 2nd-generation of the most popular drone on the market, manufactured by the most popular brand. DJI Phantom 2 was a big hit when it first came out on the market. Nowadays, due to the Phantom 3 and 4 already been released, we can finally acquire Phantom 2 for under $500. What does one expect from a top rated quadcopter? Exactly, top quality performance. Phantom 2, together with the entire Phantom series, offers the performance anyone dreams of. Extremely stable and easy to control, Phantom 2 has a smooth and steady flight even in the hands of rookies. Phantom 2 specifications on the other hand, are still quite impressive if we consider the drone was released in 2014. The maximum control range is 1km, at the time was an astonishing long-range, and still is. Flight time is also an incredible 20 minutes per battery (varies according to payload). DJI Phantom 2 is a good drone but maybe too old so we suggest you to buy DJI Phantom 4 which we reviewed here. DJI only started manufacturing their own cameras together with the Phantom 3 line. The Phantom 1 and 2 were still aimed at GoPro usage. That’s why this Phantom 2 doesn’t include its own camera. Instead, comes with a Zen muse H4-3D gimbal to perfectly fit your GoPro camera 3 and 4 on. The gimbal eliminates vibration and rectifies image tilting and deflecting, ensuring high-quality footage. Note: Gimbal requires installation and calibration using the downloadable DJI gimbal software. Phantom 2 isn’t a very autonomous drone, unlike the most recent models. In fact, Phantom 2 doesn’t have an impressive set of features (according to today’s standards). But you can still count with: Auto Return-to-Home and Landing, IOC (Intelligent Orientation Control), and Advanced Power Management. One of the most interesting camera drones on this list, Rabing RC comes with a 16MP Sony Fish-eye camera. Ideal for recording sporting events such as cycling, skiing, skateboarding, etc. Equipped with GPS Visual Tracking, there’s not a better under $500 camera drone for outdoor sports. This Rabing RC drone although not ideal for learning, we still consider it to be beginner-friendly. It has a stable hover and is highly maneuverable. It can be flown indoor and outdoor, but if you truly want to unlock its potential fly it outdoor. The quad can be controlled via 2.4Ghz remote controller or via a smartphone app. The drone has a max speed of 12m/s, not recommend to beginners. This drone’s control range is on average but varies according to which controller you are using. For example, if you use the 2.4Ghz remote controller it has a max control distance of 600 meters. If you use your own smartphone or tablet by connecting to the app via Wifi, the connection only goes as far as 300 meters (in good flight conditions). The flight time, however, is an impressive 20 minutes (11.1V 2000mAh li-po battery). As expected from a camera drone, it must, of course, come with a good quality camera. Rabing RC packs a 16MP 1/2.3” Sony CMOS Fish-eye camera with a 169º Field of View. It can record Full HD video in 1080p resolution at 60 frames per second. To enhance the camera experience, this quad has a built-in 3-axis electronic image stabilization system that eliminates vibration and rectifies image tilting and deflecting. Ideal features for filming radical sports. It can also transmit Live Video directly to the pilot’s smartphone screen. To take video recording to a whole other level, the drone features Visual Tracking, meaning it can track the object by locking it into the center of the lens, giving the pilot more freedom by freeing his hands. Rabing also features a Dual-Positioning GPS System that functions both indoor and outdoor. Other more common features are: One-Key Automatic Return, Altitude Hold, and One-Key Takeoff and Landing. "Ideal For: Intermediate, Experts and Racing Beginners." Traxxas Aton Plus is a very interesting quadcopter. It’s not very popular, and most likely you have never heard of it before. However, Aton is a feature-rich drone mainly used for semi-professional and academic video recording. Traxxas Aton Plus is not hard to control, however it’s not the most beginner friendly quad in the market. In fact, we wouldn’t recommend it to beginners, it’s a better fit for pilot’s who have controlled a drone before. Experienced pilots will get the most out of it, because it can be a very sportive drone, extremely agile and fast, hitting a detailed 80km/h (50mp/h). Even on Sport Mode the drone is easy to maneuver thanks to its 6-axis flight stability. One negative aspect of Aton Plus is the control distance which falls below average when compared to other drones on this list; max range is only 300 meters. On the other hand, flight time is an impressive 20 minutes (of course it depends on the payload). As previously mentioned, Aton Plus is a very versatile and feature-rich quad. First of all, it features 3 different flight modes: Film Mode, Sport Mode and Expert Mode. As the name suggests, Film Mode is for capturing beautiful aerial footage and photos, while Sport and Expert unlock the drone’s true potential (not recommend to beginners). Other features are: Return to Home, Status Bar, Dual-Mode GPS, Traxxas Flight Link (customize Aton’s flight settings such as geofence radius, flight ceiling, control rates), open source software that is compatible with applications such as Mission Planner. The FPV version of the U49 drone series by UDIr/c. Blue Heron is an awesome FPV (First Person View) entry quadcopter to anyone looking for a good and durable aircraft with Live Video. Like its brother Red Heron, Blue Heron is a good fit for any skill level, from beginners to experts. Can be easily flown without much hassle. It’s stable and responsive to the controls. Can be flown indoor and outdoor. However, also avoid flying it on windy days. It also has 3-speed modes. Blue Heron’s best characteristic, besides the Live Video, is also the 15-minute flight time per battery. The package includes 2 batteries, so you can switch batteries and extend the flight time to 30 minutes, which is an amazing bonus! In terms of control range, Red Horen has a maximum distance of 100 meters. The camera’s outcome photos and videos have the same good image quality as the Red Heron. The only difference is that U49W supports Live Video. This Live Video is transmitted via WiFi directly to the pilot’s smartphone device through a free to download app, available for both Android and iOS. Basically, it’s the same camera but with FPV support. Packs a standard set of features, namely Headless Mode, Altitude Hold, Low Battery Alarm, One Key Takeoff and Landing. Unfortunately, it does not feature 3D flip, which can be disappointing to children because it can’t do 360º aerial spins with the push of a button. "Ideal For: Racing Beginners but not First-Timers Flying a Drone." Manufactured by one of the most renowned drone companies in the market, F210 by Walkera is the company’s entry-level FPV drone racer. Aimed for everyone looking to get into this new sport but doesn’t necessarily have the skills to build a custom-made drone from 0. Once again we must start by pointing the fact this is a racing drone, therefore it’s not suitable to people flying an aircraft for the first time; despite being a drone for beginners, it’s beginners at racing, and not overall rookies. This being said, F210 is of course extremely fast and highly maneuverable, very responsive to commands. It uses KV2500 brushless motors. In terms of specifications, Walkera F210 has a decent maximum control range of 400 meters (with the included transmitter and factory settings), plus a below average flight time of 8 to 9 minutes (14.8V 1300mAh 40C 4S Li-PO battery). The Walkera F210 comes with the same camera as the Arris X-Speed 280, the Sony 700TVL. The most standard cameras among racing drones are the 600TVL and 700TVL, both being a perfect fit for beginners and even experts. It transmits the Real-Time video of the race to an FPV monitor or FPV goggles. One particularity about F210 is that it comes with the famous DEVO 7 transmitter which luckily has an incorporated 3.5” LCD FPV monitor. However, if you are truly serious about drone racing, you will eventually need a professional set of FPV goggles. The F210 makes use of the KV2500 brushless motors, F3 Flight Controller, Brushless ESC F210(CW/CCW), OSD, and of course the DEVO 7 transmitter. The essentials to compete in amateur drone racing without having to build your own racer. Are you interested in drone racing but don’t have the knowledge to build a custom-made racing drone? Don’t worry, that’s why Arris X-Speed 280 is here! A fully assembled, tuned and tested racer ready to get on the track. Package comes with all you need to start flying right out of the box (except FPV monitor, goggles and battery charger). X-Speed 280 is for racing beginners but not for those who are flying a drone for the first time, it’s important that we point that out first. It’s highly maneuverable and fast. To boot, it is very responsive to controls thanks to the Raptor 390 Tower 4-in-1 30A ESC + F3 + OSD + PDB. The ESCs are Flycolor 30A BLheli-s 4 in 1 and the brushless motors are S2205 2300KV. Therefore, expect a lot of power and speed. Specs vary depending on battery being used, payload, flight conditions for 5.8Ghz connection, etc. However, you can expect a flight time around 12 to 15 minutes and a control distance around 900 to 1500 meters. To keep your eye on the track, X-Speed 280 comes with a Sony 700TVL 3.6mm camera capable of recording and transmitting Live Video to a FPV monitor or FPV goggles. 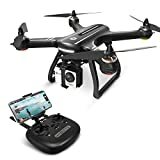 The camera is pretty good quality so even if one day you want to make some upgrades to the drone, most likely you won’t feel the need to get a better camera. Besides the already mentioned Arris 12A EScs and the awesome Raptor 390 and brushless motors, Arris X-Speed 280 also features a CC3D flight controller, one of the most commonly found in standard racers. It also comes with a RadioLink AT9S Transmitter + R9DS Receiver (an upgrade from the previous Radiolink AT9), and Foxeer 5.8Ghz antenna. An award-winning drone, prizes include Red Dot Design awards in 2016 and ‘Red Dot: Best of the Best’ award. Xplorer V is not a newly released drone, but it has passed the test of time and remains to this day a top drone worthy of the best drones under $500 list. Super easy to set up: pre-tuned by factory and ready in minutes, Xplorer V ensures great performance, ideal for any unexperienced pilot who needs to record aerial footage without having to buy a $800 drone. The Xplorer V has a stable hovering and powerful motors, able to fly even in windy days without any hassle. First, we would like to mention that Xiro Xplorer V is also an outstanding fast drone, capable of hitting 55 km/h (34mp/h), which is very impressive. Secondly, the above average flight time of 25 minutes, powered by a smart 11.1V 5200mAh Li-Po 3S battery! Its maximum control distance is decent, a good 500 meters. The Xplorer V it’s one of the cheapest and most viable options for aerial photography and videography without investing too much money on a high-end super expensive drone. It’s equipped with a 14MP Full HD 1080p camera, placed on a 3-axis stabilized camera gimbal that allows for different recording angles. The gimbal will eliminate vibrations ensuring you get a high-quality video and photo without any ‘jello effect’. As the camera drone it is, of course it includes features that enhance videography and photography. These are: Follow Me Mode, Smart Follow (Follow Snap in-app), Altitude Hold, Position Hold, Flight Planning, Autonomous Flight, Automatic Landing, Return to Home and GPS compatibility. As you can see it has a wide set of features, but the ones that truly make it stand out from the rest is the Follow Me, Smart Follow and of course Autonomous Flight (works through waypoints on the app). "Ideal For: Beginners, Intermediate and Experts." The Ghostdrone 2 is one of those drones most people aren’t aware of, mainly because it hasn’t hit the main stores. However, it provides a very unique and immersive experience. Made for beginners, Ehang Ghostdrone is a “cheap luxury” drone. Meaning it’s an affordable alternative to the Phantom series. It’s easy to control but does have one particularity, doesn’t use a RC transmitter. Instead makes use of the pilots Android and iOS device by connecting via Wifi through a free to download app. This is very common among toy drones, not so much on under $500 drones. However, the Chinese company Ehang did this in order to maintain Ghostdrone 2 as affordable as possible without sacrificing camera. Note that the VR Goggles are sold seperately. The Ghostdrone 2 has on average specs, in fact, flight time is slightly above average. It 2 can fly for periods of 25 minutes and go as far as 1km without losing connection (highly depends on flight conditions and connectivity). The camera is one of the highlights of this drone, Ghostdrone 2 comes with a spherical Ehang Sports camera 4K 12MP camera and a 3-axis gimbal. Although it comes with its own high-quality action camera, Ghostdrone gimbal mount easily supports others such as GoPro Hero 3, GoPro Hero 3+, GoPro Hero 4. The included camera has an aperture of 2.8 as well as a 93-degree wide-angle lens and is capable of transmitting Live Video to the pilot’s smart device or even FPV goggles. Ehang Ghostdrone 2.0 features a very nice set of functions, some that are often only found on higher-end drones. We are talking about Waypoint Mode, Companion Mode, Avatar Mode, and Flight Planning Mode, all available on the drone’s app. It also features Low-Battery Auto-return and GPS. AiBao is a very unique aircraft that brought a whole other perspective to the drone industry. Let me ask you, have you ever thought about playing Augment reality (AR) games with your quad? Well, now you can. While the AiBao doesn’t have the amazing performance than the top drones on this list have, it still is capable of performing incredibly great. Stable and very responsive to controls (as expected if you actually want to play AR games with it). The Walkera AiBao is at the end of the day it’s a very capable drone. When it comes to specs, AiBao is also able to shine. In fact, we were honestly surprised at the specifications of this drone. Flight time is around 18 minutes, which is right on the higher-end of the average distance. Control range is a surprisingly long 1.5Km, something we didn’t quite expect, but it’s in fact true. The built-in camera not only allows you to record awesome aerial footage in 4K at 25 frames per second, but it can also take 16MP photos with a 100º Field of View. The image sensor is Sony so you know you are in good hands. Walkera AiBao transmits Live Video directly to the pilot’s smartphone or tablet (remote controller has a tablet/phone holder). Make use of the amazing built-in 4K camera, AiBao presents a very unique feature: Augmented Reality games. What does this mean? If you wear the VR (Virtual Reality) Goggle glass, or even on your app, you can watch virtual and play virtual games. These games are: Racing (set up a virtual race track and experience it in the real world through the AR Drone App); Combat (powerful virtual weapons can be used to fight and shoot down enemy aircraft); Collection (collect coins in an augmented reality world and gain points to beat the level). "Ideal For: Beginners, Intermediate, Experts and FPV Beginners"
A complete FPV experience for beginners. Wingsland M5 is beautifully designed drone that comes with a built-in 720p 25fps camera. Extremely easy for beginners thanks to the GPS-Assisted Hover. M5 was designed for first-time pilots that want a complete FPV (First Person View) flight experience from a higher-end drone instead of a toy drone. The Optical Flow Sensor provides an incredibly stable and accurate flight and altitude hold. If you wish, M5 can become truly fast, able to hit 12m/s, although we wouldn’t recommend this to beginners. The drone can be flown via 2.4 Ghz remote controller or Android / iOS app. If you are controlling the drone through your smartphone or tablet, the control range is extremely short, only 100 meters, way below average when compared to other drones. However, if you use the included controller than the max range is 500 meters. Powered by a 1500mAh battery, flight time is on average, a good 17 minutes. The built-in camera has 720p resolution and records at 25 frames per second. The lens has a somewhat narrow-angle of 63º FOV. Although not the best image quality you can possibly get for a drone within this price range, it’s good enough to ensure moderate image quality even for Live Video. This Live Video is transmitted directly to the FPV monitor built-in on the 2.4Ghz remote controller. Besides the already mentioned Optical Flow Sensor and Altitude Hold, Wingsland M5 also features GPS, Follow Me Mode and Return to Home. A decent set of features, but nothing too fancy. For its current price it should have autonomous flight modes. Most likely you have already heard of WLToys before, it’s one of the most active RC products manufacturer in the market, constantly releasing new RC aircrafts. One of their most interesting quads, it’s this one right here, the large X380. Despite not being a newly released drone by no means whatsoever, in fact, it’s been around for quite some time. The reason why X380 is still on the market is exactly due to, in part, to is performance. Used by many pilots has a cheaper alternative to camera drones, X380 large size and powerful motors (2212 950KV brushless) enable it to transport a wide range of cameras, GoPro for example. One important characteristic that truly makes X380 stand out from the rest is its flight time. X380 can fly for periods of up to 30 minutes! Yes, you read that correctly half an hour. It of course will vary depending on payload. Control range is also surprisingly good, 1km. Unfortunately, it does not come with a camera, you will have to purchase an action camera, such as the GoPro, or use one you already have. The drone however, comes with a gimbal mount where you can easily fit the GoPro. WLToys X380 features a nice set of useful features, that will enhance and assist the flight experience. For example, Headless Mode, One-Key Takeoff and Landing, GPS Positioning, Air Pressure Height Sensor and Failsafe Auto-Return. Not the most breathtaking set of features, but far from the worst. Are drones under $500 ideal for learning? It depends. This is a tricky question, why? Because in one hand, drones within this budget feature very accurate hovering and are extremely stable even in wind conditions. Most feature autonomous functions that assist the pilot during the flight. These are drones that if you place the remote controller on the table and don’t touch it, the drone will still hover steadily without any pilot’s input. However, in the other hand, they do cost a few bucks so if you make any damage to hit of course it will cost more to repair than a toy drone. Therefore, while indeed these are suitable for beginners, we would advise you to start by flying a toy drone made of plastic, just to get the hang of it before moving on to a higher-end product. Note: If this is the first drone you own but you have already flown a friend’s drone before, go ahead and practice with it, won’t be a problem. Note 2: There are many beginners who started flying drones with DJI Spark and Phantom 2 (the top drones on this list), those we would recommend to any beginner. Can I fly indoor and outdoor? If you are a beginner no, because you will need a wide open area to practice. However, most of these drones are stable enough to be flown indoor without any problem, so if you already have some level of practice, then go for it. Throughout the article, we will mention which ones are suitable for indoor and outdoor. No. These are not toy drones. If you want to buy a drone for your kid we would refer you to our Top 10 Best Drones Under $100 list instead. Do I have to register my drone with FAA? If you live in the US, FAA registration is required to any unmanned aircraft for recreational and commercial use if it weighs more than 0.55lbs (250 grams). Yes, practically every drone on our list is capable of carrying GoPro, Xiaomi and SJCam action cameras. Some of them however already come with a pretty good quality camera. However, if you prefer to attach your GoPro (or other) go for it. Are there drones under $500 suitable for filmmaking and professional video recording? Some of them are. We will mention the drones that are often used for semi-professional and academic filmmaking. Although not suitable for professional video recording (apart from Phantom 2 and UPair 4K), they are still able to get top quality aerial footage. When looking for a great 4K drone for filming, you might want to up your price range just a bit. Before you go, here is a recap of our top 10 drones under $500, ranked in order. Don’t forget to share best drones under 500$ article with your drone enthusiast friends on Facebook and leave a comment down below! Have fun and Happy flying!